“Bespoke” is a formal term used in British English for tailor-made clothing that is made at a customer’s request and exactly to their specifications. 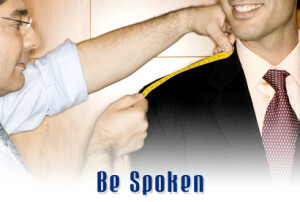 The term is derived from the old verb “to bespeak”, meaning “to speak to, to request”. At SHURS, we believe in customizing our research method and process through in-depth communication with each client. What kind of information should we obtain? What is the most effective method to obtain such information? How should the findings be weighed and analyzed? These are some of the basic but vital questions we consider when designing a survey. Many of our clients are proactively involved in marketing activities and are knowledgeable in market surveys and research. They usually work under extreme pressure and are often required to make speedy decisions. We do our best to help them save time and effort by providing a “bespoke” research service. We review their objective, design a research method, carry out the survey, compile the findings, and then create an analytic report – all in one package. Regardless of the complexity or irregularity of the research, we provide viable solutions to meet the client’s objective, while maintaining a flexible stance so that we can handle any last-minute requests for changes. At SHURS we strive to be our marketing clients’ best possible supporter. In 1996, SHURS established a panel member system COMPASSNET. From conventional methodologies to modernistic online surveys, various techniques are used to meet clients’ needs. Inhouse interview/test rooms are available for immediate implementations of focus group interviews and central location tests. We will recruit “Those who you exactly want to listen to” by setting up proper target and all kind of screening. And our in-house moderator will draw out bottom-line remarks. The spacious venue allows the use of display racks and display of large-size mock-ups. We are familiar with various means of packaging, addressing and sending sample products. In-house handling of such process allows us to control the quality of the service and to protect our clients’ mailing list. We have the know-how for various product tests, including package test. As we are equipped with the multiple facilities for survey, after conducting the a CLT (hall test), selected respondents can be lead to taking part in the subsequent focus group interview on the same day. We differentiate ourselves from internet research companies with our flexible and attentive services. Reports on online surveys involving our COMPASSNET respondents come in various forms including findings summary, aggregate analysis, and graphs and charts. Although it requires time and effort, conventional ‘analog’ methodologies are still effective especially for sophisticatedly designed research. We have expertise in various forms of survey including mail survey and door-to-door survey. Our capabilities for detailed target analysis and creative concept work allow us to assist our clients in designing and developing products, and in devising marketing strategies. We have a proven track record of collaborative projects with design houses.